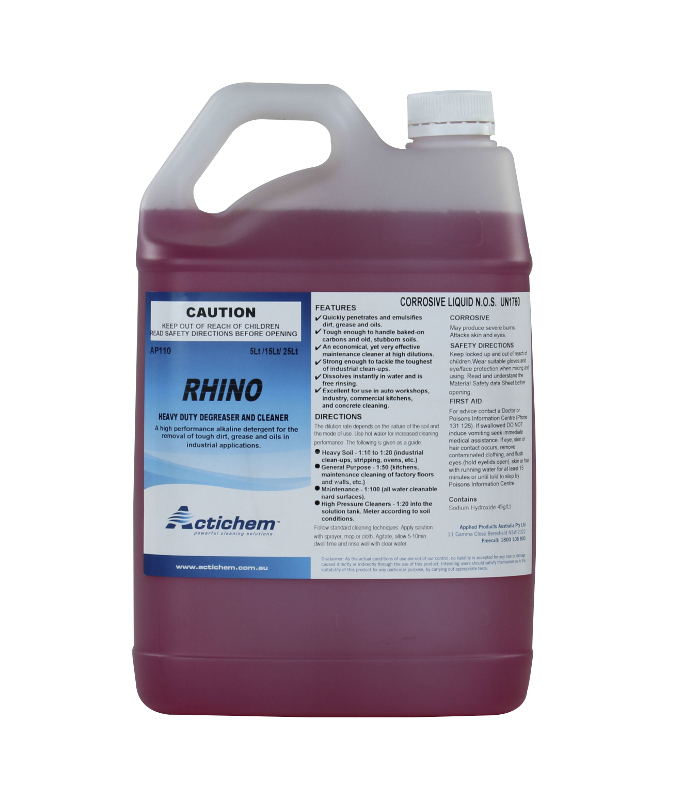 Actichem's AP110 Rhino, heavy duty degreaser and cleaner is effective in removing tough dirt, grease and oils in industrial applications. It quickly penetrates and emulsifies dirt, grease and oils. It is touch enough to handle baked-on carbons and old, stubborn soils. An economical, yet super effective maintenance cleaner at high dilutions. It is suited well for use in auto workshops. industry, commercial kitchens, and concrete cleaning. 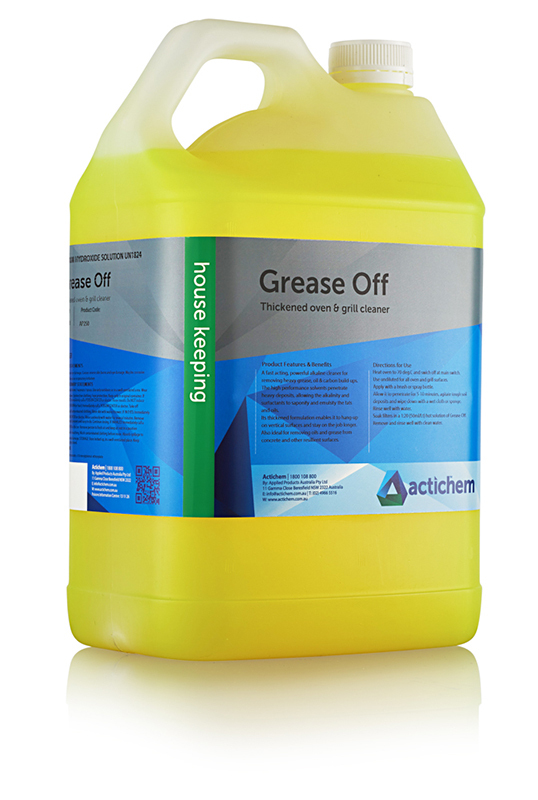 Actichem's AP125 Aquasolve - high Performance degreaser is a non-caustic yet powerful degreasing cleaner which is ideal for us in industry, commercial, kitchens and restoration work. It is a special surfactant, solvent blend which quickly penetrates and emulsifies tough soilage, grease, oils, and carbons. It is great to use in industrial clean-ups, equipment cleaning, on concrete floors and as a vehicle cleaner. 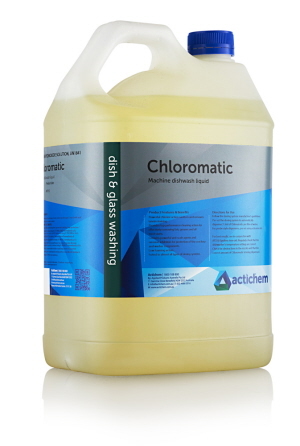 It can effectively remove fats, greases and carbons in commercial kitchens, washrooms and in fire restoration cleaning. 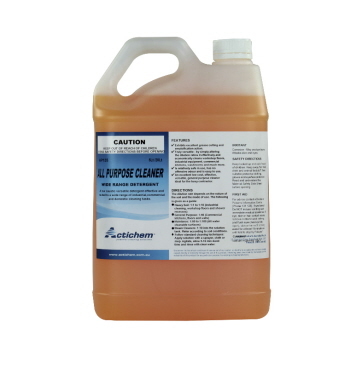 Actichem's AP135 All Purpose Cleaner is a low caustic versatile detergent effective and can be used to a wide range of industrial, commercial and domestic cleaning tasks. It exhibits excellent grease cutting and emulsification action. It is relatively safe in use, it has no offensive odour and is easy to use. 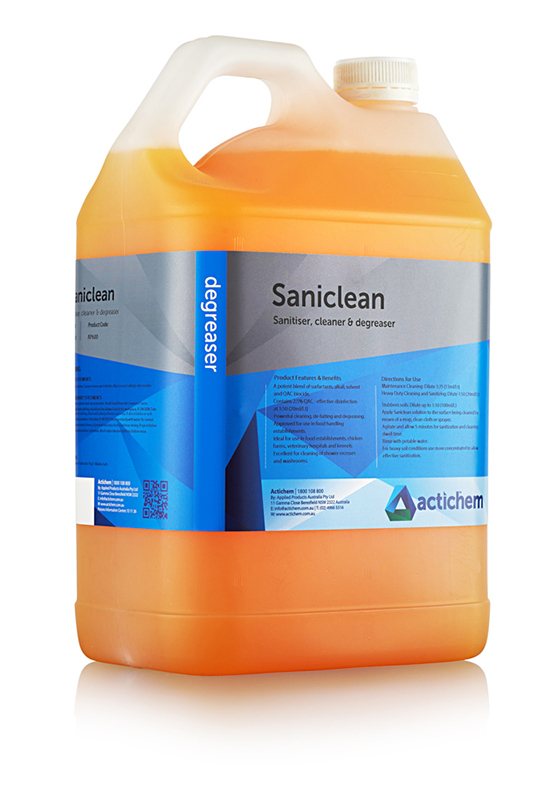 It is an excellent low cost, effective, versatile, general purpose cleaner - ideal for the busy contractor. Actichem AP140 Swift Laundry and Prespray Spotter is a quick acting pretreatment for the removal of collar and cuff grime and difficult spots from laundry and most fabrics. 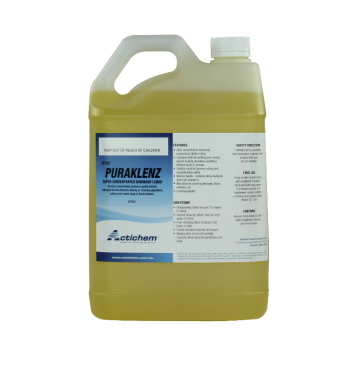 It is a great general purpose cleaner for kitchens, workshops, vehicles, etc. Water based, caustic-free which is safe on car, paint, aluminium, etc. This is absolutely safe on almost all clothing and upholstery, carpet fabrics. Actichem AP180 Citrus Solve is a superior all-purpose cleaner, utilizing naturally derived ingredients for a powerful and effective clean, easily and safely achieved. This heavy duty degreaser is pleasant to use leaving a fresh, citrus scent. It is well suited for use in autoscrubbers, pressure washers and carpet cleaning machines. It is excellent for use on concrete floors, tiled floors and walls, defatting and cleaning of kitchen surfaces, carpet cleaning and laundry spotting. This product is discontinued. Excellent alternative is Aquasolve. Actichem AP212 Chloromatic is a machine dishwash liquid with high performance, chlorinated detergent for use through automatic dishwasher dosing systems. Its powerful chlorine action sanitizes and removes tannin staining. It also provides top performance cleaning action for effectively removing fats, greases and all food stains. It is suited to almost all types of dosing systems. 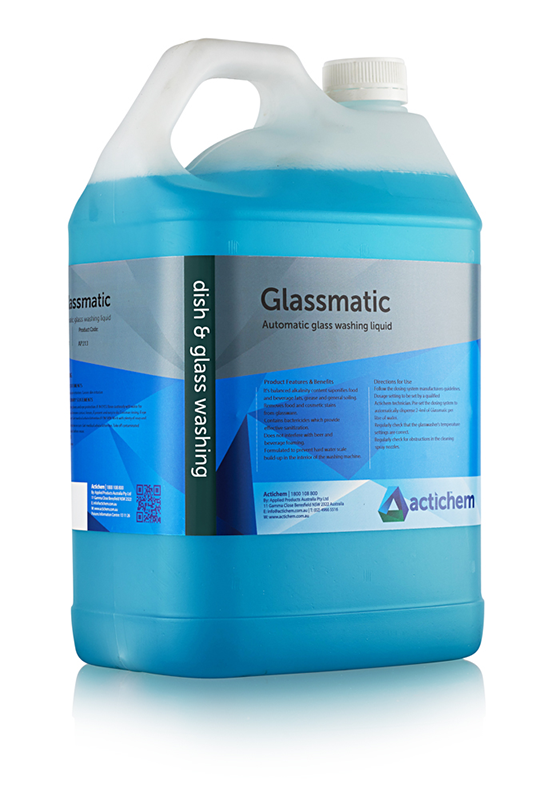 Actichem AP213 Glassmatic is a professionally formulated, glasswashing liquid created for use through automatic glass washing machines. It is formulated to prevent hard water scale build-up in the interior of the washing machine. It's balanced alkalinity content saponifies food and beverage fats, grease and general soiling. 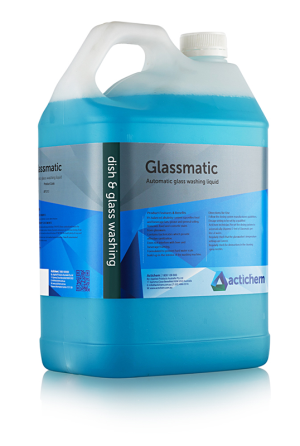 It effectively removes food and cosmetic stains from glassware. It also contains bactericides which provide effective sanitisation. Actichem AP218 Auto Dishwash Powder is a high quality, alkaline dishwasher powder ideal for use in domestic and commercial dishwashers. It cleans and sanitizes crockery, cutlery and glassware. It prevents hard water scale build-up in the dishwasher. This product is DISCONTINUED. 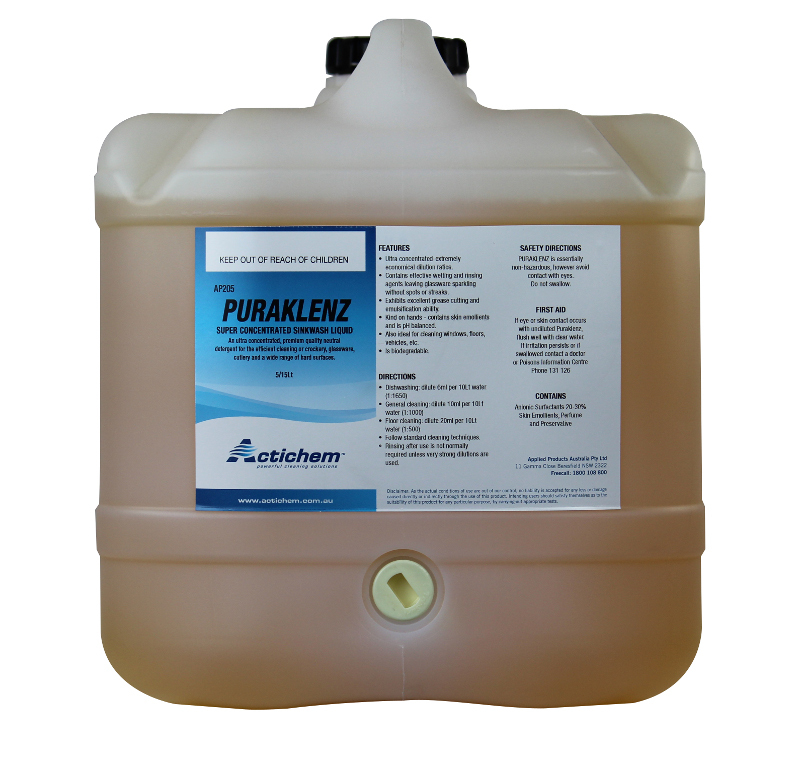 AP219 Dishwash deluxe is an excellent alternative. 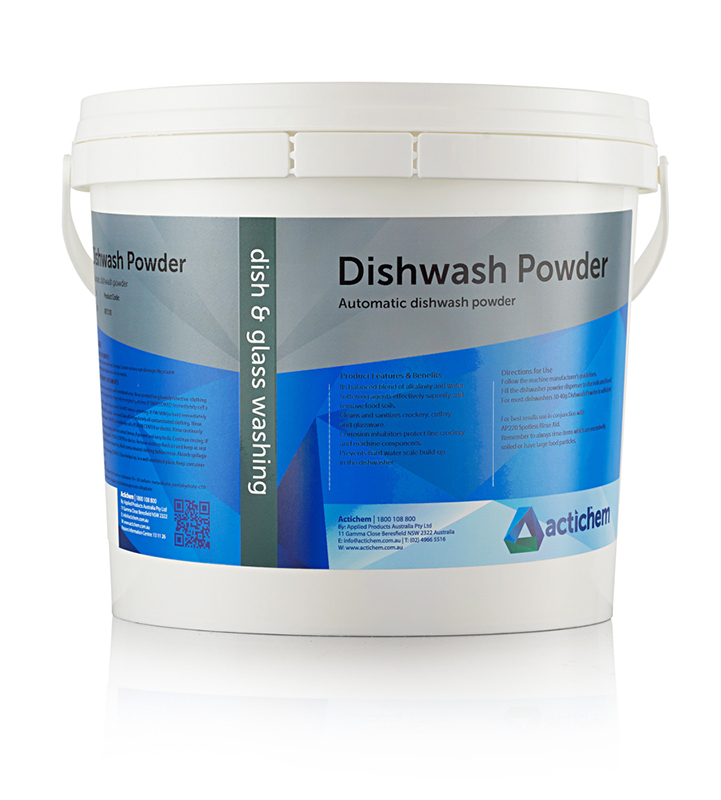 Actichem AP219 Dishwash Deluxe is an oxygenated, top performing enzyme dishwash powder and is 100% caustic free. 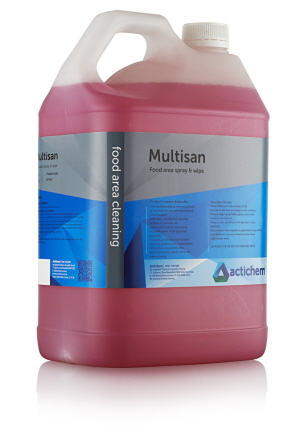 It breaks through food and beverage soiling without the use of harsh caustics and chlorines. It is powerful enzyme action tackles tough food soiling. 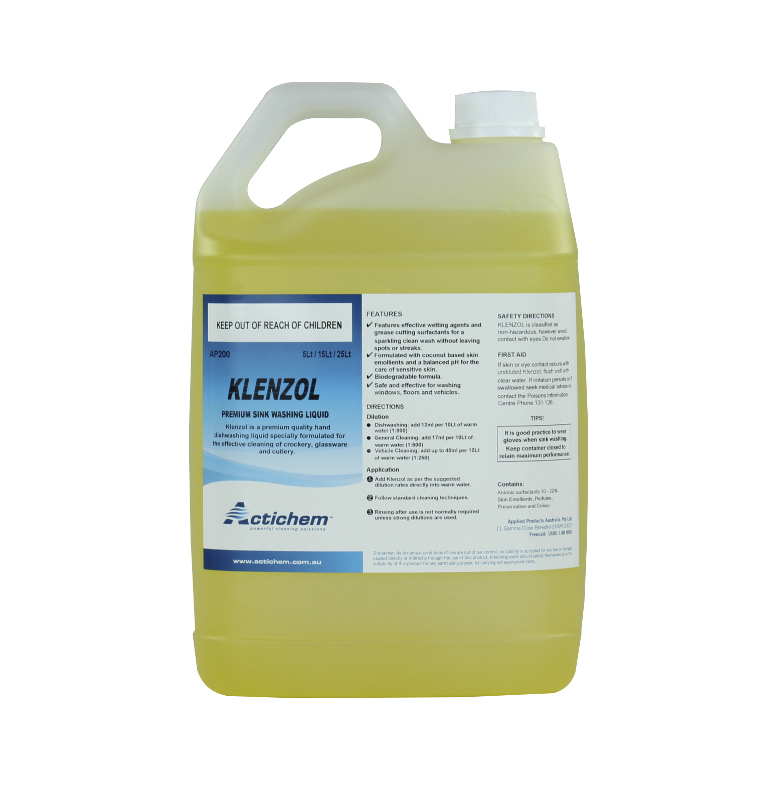 Oxygen boosted for effective sanitization and destaining action. It provides top cleaning performance whilst giving premium care to delicate crockery, glassware and cutlery. It provides excellent spot and streak free results. Actichem AP250 Grease Off is a thickened alkaline oven and grill cleaner boosted with powerful solvents. It is for use on domestic and commercial cooking and baking equipment. It quickly removes heavy grease, oil and carbon build-ups. Its thickened formulation enables it to hang-up on vertical surface and stay on the job loner. It is excellent for removing oils and grease from concrete and other resilient surfaces. 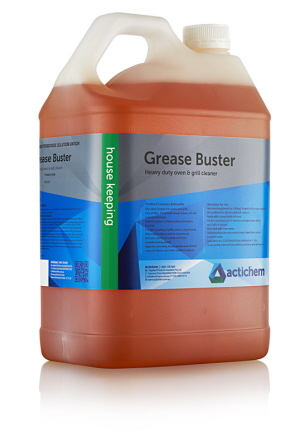 Actichem AP253 Grease Buster is a high performance oven and grill cleaner. It quickly removes grease, oil and carbon build-up from commercial and industrial cooking and baking equipment. 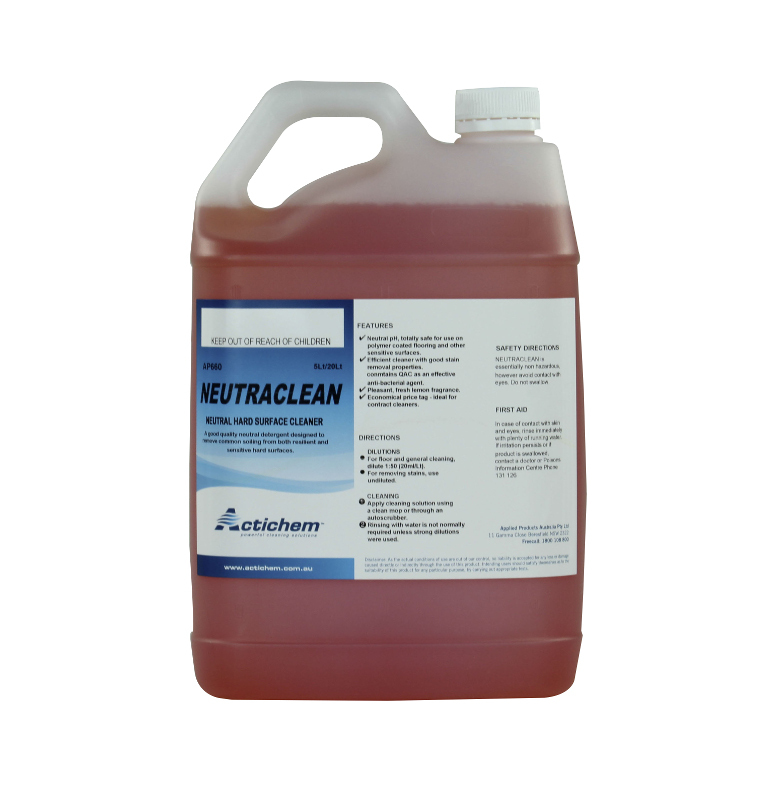 This is the ideal cleaner for ovens and grills, range hoods, filters and bakery racks in commercial kitchens, fast food outlets and food manufacturing plants. It acts fast- penetrates tough grease, oil and carbon build-ups. It is suitable for removing heavy grease and oil from concrete floors and other resilient surfaces. 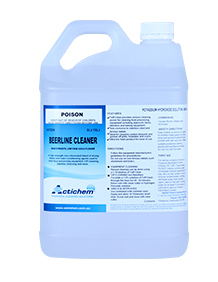 Actichem AP254 Beerline Cleaner is a high non-chlorinated alkaline detergent used to cleand and keep beerlines free of beerstone and yeast build-ups. Having a clean beerlines, you can guarantee good tasting, good quality beer every time. Actichem AP260 Multisan is a professionally formulated spray n' wipe cleaner approved for use in all food manufacturing and preparation areas. It gives excellent cleaning performance on all hard surface areas. Approved for use in food preparation and manufacturing environments. AQIS approved. 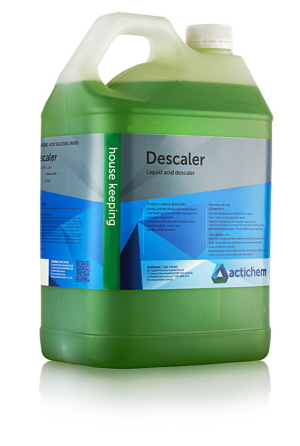 Actichem AP280 Descaler is a liquid descaling compound that quickly and effectively removes hard water scale build-up in dishwashers, urns, kettles and other heat transfer equipment. It contains an effective anti-corrosion agent. It is readily soluble in water. Actichem's AP600 Saniclean, heavy duty alkaline detergent cleaner and sanitizer which provides powerful cleaning and sanitization in commercial kitchens, abbatoirs, and food manufacturing facilities. 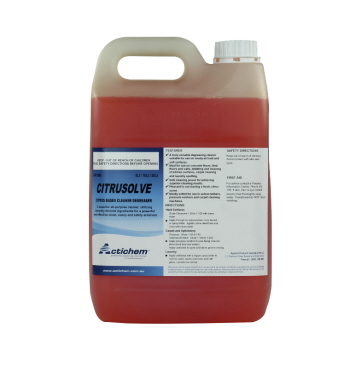 It has a potent blend of surfactants, alkali, solvent and QAC biocide. It is powerful for cleaning, de-fatting and degreasing ability. It is approved for use in food handling establishments, chicken farms, veterinary hospitals and kennels. It is excellent for cleaning of shower recesses and washrooms. Actichem AP661 Neutraclean is an efficient, premium neutral pH floor cleaner with good stain removal properties. Contains QAC as an effective anti-bacterial agent. It is designed to remove common soiling from both resilient and sensitive hard surfaces. It has a pleasant, fresh lemon fragrance. 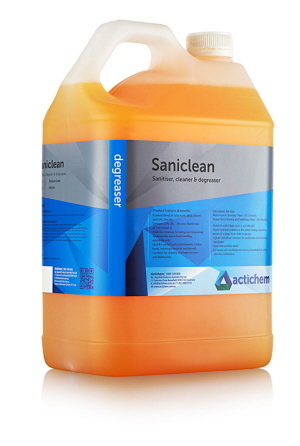 This is ideal for contract cleaners, it has economical price tag. It has neutral pH, absolutely safe for use on polymer coated flooring and other sensitive surfaces. 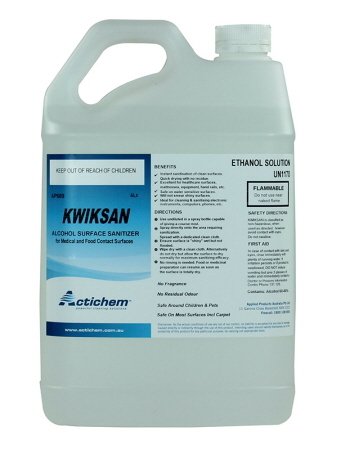 Actichem AP689 Kwiksan is an alcohol/Quat surface sanitiser suited to use in hospitals, dental surgeries and other environments where efficient rapid killing of pathogenic micro-organisms is essential to infection control. This 70% Ethanol disinfectant is designed to be used undiluted. It is ideal for use as a mattress sanitiser and is popularly used in podiatry areas. 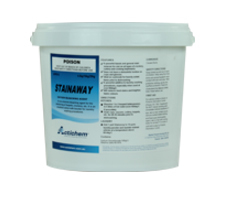 Actichem’s AP810 Stainaway is safe, non-chlorine bleaching agent for the destaining of crockery, teapots, urns, cutlery and other items subject to tannin and related staining. It is very effective as a colour safe booster to laundry washing procedures for removing stains from fabrics. It is safe for use in any food environments. 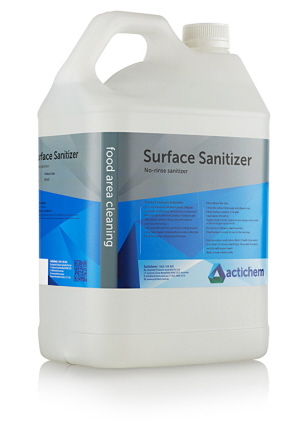 Actichem's AP685 Surface Sanitiser is a QAC based no-rinse sanitizer for use in food preparation areas such as commercial kitchens, catering establishments, food bars, butcheries, and restaurants. It is safe and effective for sanitizing cutting boards. It does not require rinsing when used as directed. Approved for use in food preparation areas. Actichem AP720 Chlorosan is a powerful chlorinated detergent with excellent cleaning capabilities and potent anti-mould, anti-bacterial action giving it a vast variety of applications. This provides highly effective removal of grass and organic stains, mould stains and food and beverage spills from most tiles, stone, masonary and concrete surfaces. 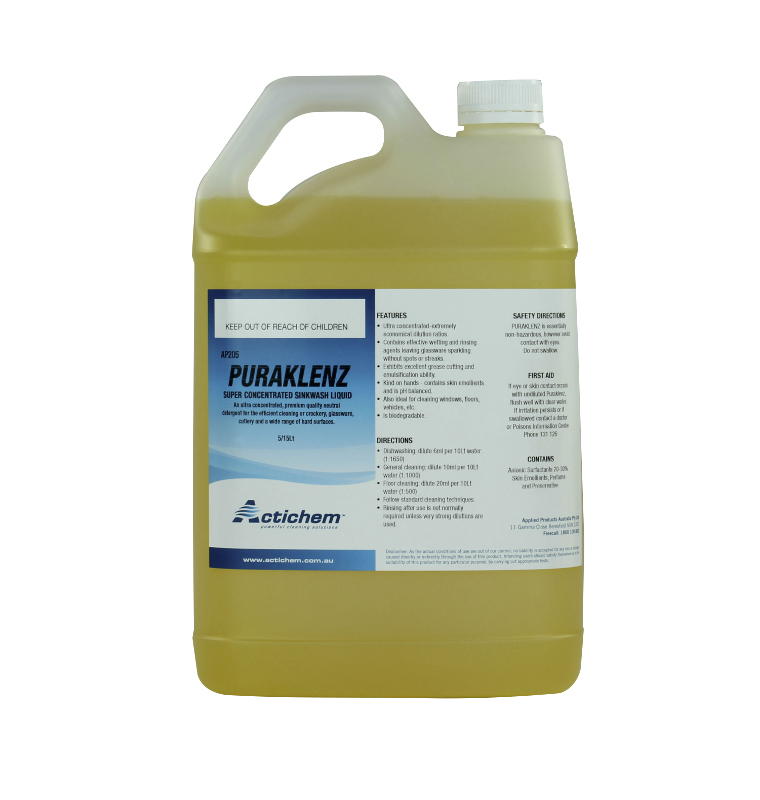 It is an effective deodorizer for bins, drains, toilets, grease traps, etc. It is AQIS approved. It is very safe for use in food preparation areas.